I made this great recipe for my best friend who is gluten-free. I made a mistake when I bought the Tamari soy sauce in the all-natural/gluten-free section of my local supermarket. I did not read the ingredient label!! The second ingredient in my purchase was WHOLE WHEAT!! FYI, check the label. Regardless of my mistake, this recipe is really tasty!! It is so light and fresh with the mango salsa. It’s seems like a lot of work, but this recipe is easy to prepare. In a large re-sealable plastic bag, combine the first six ingredients; add shrimp. Seal bag and turn to coat; cover and refrigerate for 20 minutes. 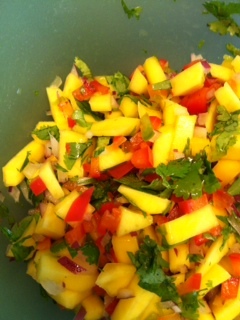 For salsa, in a small bowl, combine the mango, onion, peppers, cilantro and lime juice. Cover and refrigerate until serving. Drain and discard marinade. Thread shrimp on two metal or soaked wooden skewers. Using long­handled tongs, moisten a paper towel with cooking oil and lightly coat the grill rack. Grill, uncovered, over medium heat or broil 4 inches from the heat for 2-­3 minutes on each side or until shrimp turn pink. 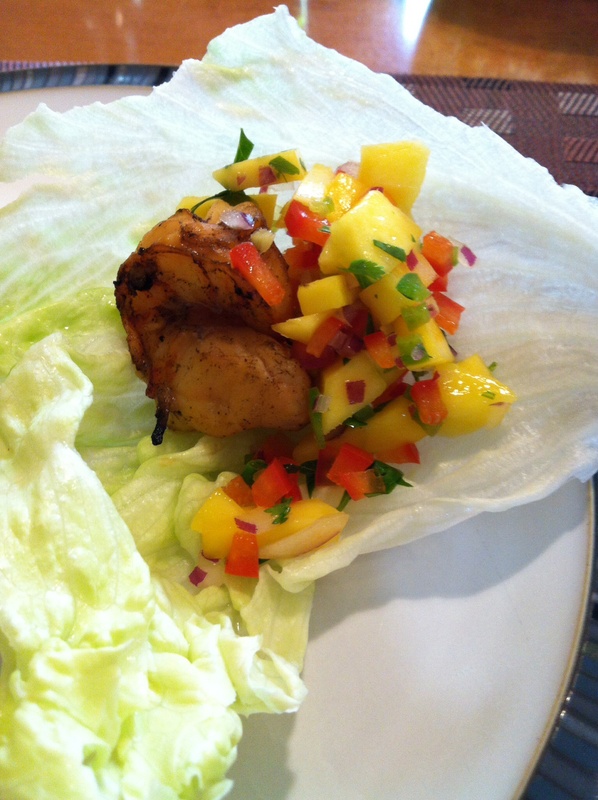 Place shrimp on lettuce leaves; top with salsa and roll up.